The setting for a performance of Verdi's Requiem on 11th November (Armistice day) was in the lovely space of Romsey Abbey. The building affords a wonderful acoustic for this type of event. The concert was dedicated to the memory of Stella Irons, Margaret Edwards and the heroes of both world wars. In the quiet opening of the piece the combined forces of the Romsey Choral Society and the Waverley Singers, accompanied by the Southern Sinfonia Chamber Orchestra, made a beautiful hushed entry in 'Requiem Eternam', eternal peace, contrasted later on in the full sounds of the 'Dies Irae', day of wrath. The sound of a few distant fireworks almost added to the ambiance of wartime sounds. Both choir and orchestra rose to each musical challenge, from calm to melodic to terrifying, brilliantly led by conductor Jamie W Hall. Verdi was well known for his operatic output, and his Requiem mass for the dead is very operatic in style. The four soloists were indeed well suited for it and made a fine balanced quartet. The bass, Jimmy Holliday, sang the 'Mors Stupebit', with beautifully rounded low notes. Tom Raskin's clear tenor soared through the different musical textures as he sang the 'Ingemisco tamquam reus'. The Mezzo-soprano Jessica Gillingwater, singing over the chorus in the 'Liber scriptus proferetur' displayed a lovely quality in the middle and high range. There were combinations of duets, trios and quartets, but the highlight of the evening, for me, was the 'Libera Me', sung by soprano Clare Tunney and the chorus. Clare's high notes were magical and her voice portrayed perfect emotion. Altogether a wonderful evening of Verdi's stunning musical masterpiece! 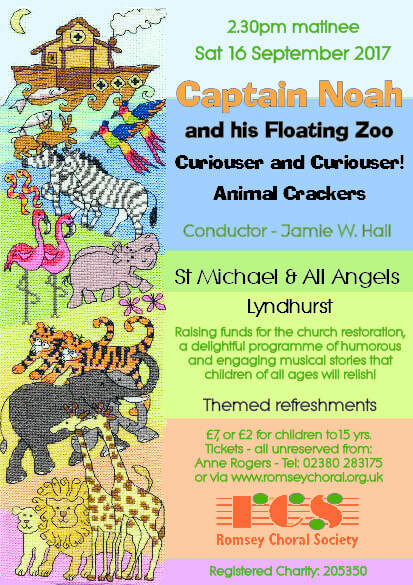 ‘How many animals can you spot?’ This was the question asked by musical director Jamie W. Hall, conducting Romsey Choral Society in their matinee concert at Lyndhurst on Saturday 16th September. The choir was making its first visit to Lyndhurst and the concert was at St Michael and All Angels, in aid of the church’s restoration fund. The programme featured Eric Whitacre’s ‘Animal Crackers’, settings of quirky animal poems by Ogden Nash, ‘Captain Noah and his Floating Zoo’ by Joseph Horovitz and Michael Flanders, and two of Jamie W. Hall’s own settings of poems from ‘Alice in Wonderland’. Introducing the pieces, Jamie said it was very special to be performing them just a short distance from the burial place of Alice Hargreaves who, as a little girl, had inspired Lewis Carroll to write his stories. ​Jamie and the choir also used Handel’s ‘Hallelujah!’ chorus to show the children in the audience how a piece of choral music is put together. George Marsh, one of the youngsters, then came up to the rostrum to have a go at conducting. Mezzo-soprano Jacqueline Fox sang the role of God in ‘Captain Noah and his Floating Zoo’ and the pianist was Andrew Hayman. Photographs: ‘Curiouser and Curiouser’ – the ladies of Romsey Choral Society performing songs from ‘Alice in Wonderland’ with Jamie W. Hall and pianist Andrew Hayman. ‘Hallelujah!’ – young audience member George Marsh conducts Handel’s most famous chorus under the watchful eye of musical director Jamie W. Hall. 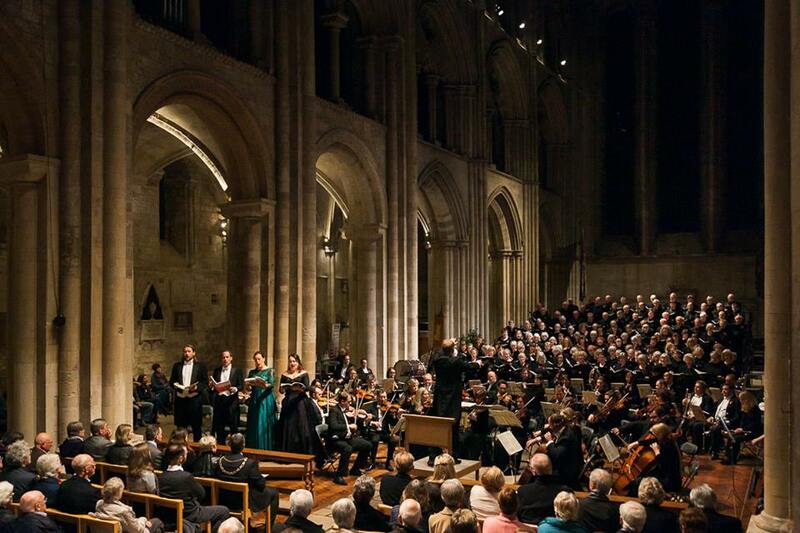 An appealing mix of orchestral and choral classic was received enthusiastically in a well-filled Romsey Abbey on Saturday. Conductor John Traill led the audience through the drama and pathos of works by an international cast of much-loved composers. ​His thoughtful remarks gave context to some of the greatest operatic and orchestral works by Bizet, Verdi and Puccini, punctuated by interludes of Rossini and Strauss overtures and dance music by de Falla and Borodin. 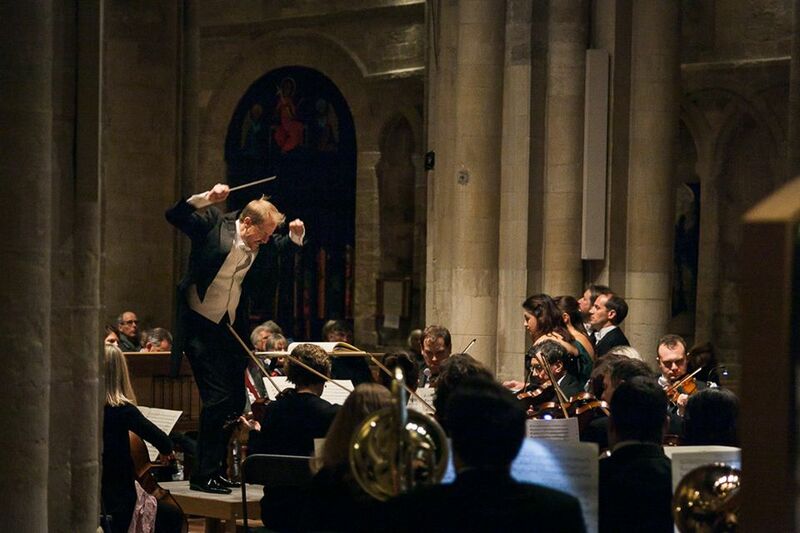 Romsey Choral Society (RCS) joined forces once again with the City of Southampton Orchestra (CSO) to create a vibrant musical offering in an exceptionally well thought out musical programme. Their obvious enjoyment in performance created some exciting interplay between orchestra and chorus. This was evident in the boldness of the Matadors’ Chorus from La Traviata, with a confident choir matching the lively response from the instruments. The Polovtsian Dances from Prince Igor, which preceded the interval drinks, provided a showcase for a range of vocal accomplishments and orchestral standouts, with notable low notes from the brass. One highlight of the evening was the deceptively simple-sounding Humming Chorus from Madame Butterfly. The orchestration is subtle and subdued and RCS supplied the sensitive and controlled melody that emphasises the complex emotions of the eponymous heroine as she waits for her lover. No one musician can dominate in this work and the CSO and RCS were showing us the benefits of listening to each other and committed teamwork. Finally, everyone loves a trumpet solo, and the Triumphal Scene from Aida did not disappoint and ended the concert on just the right note! An enthusiastic audience responded to an equally enthusiastic Romsey Choral Society for an intriguing and original animal-centred programme in the Chapel of St. Cross. Taking as its text the Creation story from Genesis, Aaron Copland’s unaccompanied In the Beginning would have made a daunting opener for the best of chamber choirs. Yet RCS was totally convincing in the beautiful, dense harmonies, shifting tonalities and chant-like rhythms of this major piece. They were anchored by professional mezzo soprano Jacqueline Fox providing angular narrative links to the opulent choral textures. RCS is noted for the warmth of its vocal tone and rich blend - all impressively displayed throughout this programme. Confidence in contemporary harmonies and witty rhythmic challenges was further evident in Eric Whitacre’s brief Animal Crackers (words by Ogden Nash) whose humour was relished by performers and listeners alike. Richard McVeigh was a slick piano accompanist here and again in Joseph Horovitz’s Captain Noah and His Floating Zoo which formed the second half of the evening. With Jacqueline Fox as narrator once more the choir provided sound effects, short solo contributions and very secure diction, essential in comic repertoire. Perhaps less hectic tempi in the resonant church would have enhanced the impact of Michael Flanders’ libretto but there was no denying the joyous involvement of all the captain’s crew ! The concert’s title, Unicornis Captivatur, came from Norwegian composer Ola Gjeilo’s 2001 setting of 14th century words about mythical animals. The choir seemed completely at home with its gorgeous unaccompanied chords, changing pace and at times rapid text delivery. It was good to hear new music presented with such conviction. This is a choir whose technique and enthusiasm stem directly from its conductor, Jamie W. Hall, who also demonstrated his own considerable vocal skills in the part of beleaguered Noah. Full marks to everyone for this whole enterprising concert.